The 2018 United States House of Representatives elections were held on November 6, 2018, with early voting taking place in some states in the weeks preceding that date. Voters chose representatives from all 435 congressional districts across each of the 50 U.S. states. Non-voting delegates from the District of Columbia and four of the five inhabited U.S. territories[f] were also elected. These midterm elections took place nearly halfway through the first term of Republican President Donald Trump. 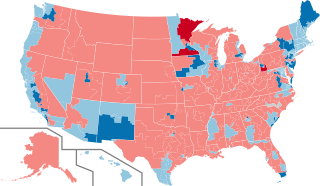 On Election Day, Republicans had held a House majority since January 2011. In the 2018 midterm elections, the Democrats, led by Nancy Pelosi, won control of the House and gained 41 seats from their total after the 2016 elections (including one seat gained previously with Conor Lamb's March 2018 special election victory). The 41-seat gain was the Democrats' largest gain of House seats since the post-Watergate 1974 elections, when they picked up 49 seats. The Democrats also won the popular vote by a margin of 8.6%, the largest margin on record for a party that previously held a minority in the House. Turnout was the highest for a midterm election in more than a century, with over half the electorate casting ballots. Upon the opening of the 116th United States Congress, Pelosi was elected as Speaker of the House. Incumbent Republican House Speaker Paul Ryan chose to retire in 2018 instead of seeking another term. In November 2018, House Republicans elected Kevin McCarthy as House Minority Leader. The Democratic Party won control of the House of Representatives in the 2018 elections. They had a net gain of 41 seats from their total after the 2016 elections. This was their largest gain of House seats in an election since the 1974 elections, when the Democrats gained 49 House seats. Democrats won the popular vote by more than 9.7 million votes or 8.6%, the largest midterm margin for any party and the largest margin on record for a minority party. Voter turnout in this election was 50.3%, the highest turnout in a U.S. midterm election since 1914. Note that the results summary does not include blank and over/under votes or votes cast in the voided election in North Carolina's 9th congressional district. Guam at-large: Delegate Madeleine Bordallo lost renomination to Michael San Nicolas (D), who then won the general election. Massachusetts 7: Mike Capuano lost renomination to Ayanna Pressley (D), who then won the general election. New York 14: Joe Crowley lost renomination to Alexandria Ocasio-Cortez (D), who then won the general election. South Carolina 1: Mark Sanford lost renomination to Katie Arrington (R), who then lost the general election to Joe Cunningham (D). No Democrats lost re-election to Republicans. California 10: Jeff Denham lost to Josh Harder. California 21: David Valadao lost to TJ Cox. California 25: Steve Knight lost to Katie Hill. California 45: Mimi Walters lost to Katie Porter. California 48: Dana Rohrabacher lost to Harley Rouda. Colorado 6: Mike Coffman lost to Jason Crow. Florida 26: Carlos Curbelo lost to Debbie Mucarsel-Powell. Georgia 6: Karen Handel lost to Lucy McBath. Illinois 6: Peter Roskam lost to Sean Casten. Illinois 14: Randy Hultgren lost to Lauren Underwood. Iowa 1: Rod Blum lost to Abby Finkenauer. Iowa 3: David Young lost to Cindy Axne. Kansas 3: Kevin Yoder lost to Sharice Davids. Maine 2: Bruce Poliquin lost to Jared Golden. Michigan 8: Mike Bishop lost to Elissa Slotkin. Minnesota 2: Jason Lewis lost to Angie Craig. Minnesota 3: Erik Paulsen lost to Dean Phillips. New Jersey 3: Tom MacArthur lost to Andy Kim. New Jersey 7: Leonard Lance lost to Tom Malinowski. New York 11: Dan Donovan lost to Max Rose. New York 19: John Faso lost to Antonio Delgado. New York 22: Claudia Tenney lost to Anthony Brindisi. Oklahoma 5: Steve Russell lost to Kendra Horn. Pennsylvania 17: Keith Rothfus lost a redistricting race to Conor Lamb. Texas 7: John Culberson lost to Lizzie Pannill Fletcher. Texas 32: Pete Sessions lost to Colin Allred. Utah 4: Mia Love lost to Ben McAdams. Virginia 2: Scott Taylor lost to Elaine Luria. Virginia 7: Dave Brat lost to Abigail Spanberger. Virginia 10: Barbara Comstock lost to Jennifer Wexton. Fifty-four incumbents (thiry-six Republicans and eighteen Democrats) did not seek re-election. Minnesota 1: Tim Walz retired to run for Governor of Minnesota. Seat won by Jim Hagedorn. Minnesota 8: Rick Nolan retired. Seat won by Pete Stauber. Pennsylvania 14: Conor Lamb instead ran in the 17th district. Seat won by Guy Reschenthaler. Arizona 2: Martha McSally retired to run for U.S. Senator. Seat won by Ann Kirkpatrick. California 39. Ed Royce retired. Seat won by Gil Cisneros. California 49: Darrell Issa retired. Seat won by Mike Levin. Florida 27: Ileana Ros-Lehtinen retired. Seat won by Donna Shalala. Michigan 11: Dave Trott retired. Seat won by Haley Stevens. New Jersey 2: Frank LoBiondo retired "due to the increased political polarization of Congress." Seat won by Jeff Van Drew. New Jersey 11: Rodney Frelinghuysen retired. Seat won by Mikie Sherrill. New Mexico 2: Steve Pearce retired to run for Governor of New Mexico. Seat won by Xochitl Torres Small. Pennsylvania 5: Pat Meehan resigned. Redistricted from the 7th district. Seat won by Mary Gay Scanlon. Pennsylvania 6: Ryan Costello retired due to "family, the political environment and redistricting". Seat won by Chrissy Houlahan. Pennsylvania 7: Charlie Dent resigned. Redistricted from the 15th district. Seat won by Susan Wild. South Carolina 1: Mark Sanford lost renomination. Seat won by Joe Cunningham. Washington 8: Dave Reichert retired. Seat won by Kim Schrier. Arizona 9: Kyrsten Sinema retired to run for U.S. Senator. Seat won by Greg Stanton. Colorado 2: Jared Polis retired to run for Governor of Colorado. Seat won by Joe Neguse. Connecticut 5: Elizabeth Esty retired after involvement in sexual harassment allegations against an employee. Seat won by Jahana Hayes. Hawaii 1: Colleen Hanabusa retired to run for Governor of Hawaii. Seat won by Ed Case. Illinois 4: Luis Gutiérrez retired. Seat won by Chuy García. Maryland 6: John Delaney retired to run for U.S. President. Seat won by David Trone. Massachusetts 3: Niki Tsongas retired. Seat won by Lori Trahan. Michigan 9: Sander Levin retired. Seat won by Andy Levin. Michigan 13: John Conyers resigned. Seat won by Rashida Tlaib, although Brenda Jones won the election to complete Conyers' term. Minnesota 5: Keith Ellison retired to run for Minnesota Attorney General. Seat won by Ilhan Omar. Nevada 3: Jacky Rosen retired to run for U.S. Senator. Seat won by Susie Lee. Nevada 4: Rubén Kihuen retiring due to sexual harassment allegations. Seat won by Steven Horsford. New Hampshire 1: Carol Shea-Porter retired. Seat won by Chris Pappas. New Mexico 1: Michelle Lujan Grisham retired to run for Governor of New Mexico. Seat won by Deb Haaland. New York 25: Louise Slaughter died. Seat won by Joe Morelle. Pennsylvania 4: Bob Brady retired after being redistricted from the 1st district. Seat won Madeleine Dean. Texas 16: Beto O'Rourke retired to run for U.S. Senator Seat won by Veronica Escobar. Texas 29: Gene Green retired. Seat won by Sylvia Garcia. Florida 6: Ron DeSantis resigned to run for Governor of Florida. Seat won by Michael Waltz. Florida 15: Dennis Ross retired. Seat won by Ross Spano. Florida 17: Tom Rooney retired. Seat won by Greg Steube. Idaho 1: Raúl Labrador to run for Governor of Idaho. Seat won by Russ Fulcher. Indiana 4: Todd Rokita retired to run for U.S. Senator. Seat won by Jim Baird. Indiana 6: Luke Messer retired to run for U.S. Senator. Seat won by Greg Pence. Kansas 2: Lynn Jenkins retired. Seat won by Steve Watkins. Mississippi 3: Gregg Harper retired. Seat won by Michael Guest. North Dakota at-large: Kevin Cramer retired to run for U.S. Senator. Seat won by Kelly Armstrong. Ohio 16: Jim Renacci retired to run for U.S. Senator. Seat won by Anthony Gonzalez. Oklahoma 1: Jim Bridenstine announced his retirement November 10, 2017. He resigned April 23, 2018, after being confirmed as Administrator of NASA; his replacement was seated November 6, 2018. Seat won by Kevin Hern. Pennsylvania 9: Lou Barletta (redistricted from the 11th district) retired to run for U.S. Senator. Seat won by Dan Meuser. Pennsylvania 13: Bill Shuster (redistricted from the 9th district) retired. Seat won by John Joyce. South Carolina 4: Trey Gowdy retired to "return to the justice system." Seat won by William Timmons. South Dakota at-large: Kristi Noem retired to run for Governor of South Dakota. Seat won by Dusty Johnson. Tennessee 2: Jimmy Duncan retired. Seat won by Tim Burchett. Tennessee 6: Diane Black retired to run for Governor of Tennessee. Seat won by John Rose. Tennessee 7: Marsha Blackburn retired to run for U.S. Senator. Seat won by Mark Green. Texas 2: Ted Poe retired. Seat won by Dan Crenshaw. Texas 3: Sam Johnson retired. Seat won by Van Taylor. Texas 5: Jeb Hensarling retired. Seat won by Lance Gooden. Texas 6: Joe Barton retired. Seat won by Ron Wright. Texas 21: Lamar Smith retired. Seat won by Chip Roy. Virginia 5: Tom Garrett retired due to alcoholism. Seat won by Denver Riggleman. Virginia 6: Bob Goodlatte retired. Seat won by Ben Cline. West Virginia 3: Evan Jenkins retired to run for Senate and resigned to become State Supreme Court Justice. Seat won by Carol Miller. Wisconsin 1: Paul Ryan retired. Seat won by Bryan Steil. Colorado 7: Ed Perlmutter (D) announced his retirement April 9, 2017, to run for Governor of Colorado. He returned to the U.S. House of Representatives race on August 21, 2017 and won reelection. New York 27: Chris Collins (R) was renominated but then withdrew after being indicted for insider trading. On September 17, 2018, he rejoined the race. He won reelection. Pennsylvania 7: Pat Meehan (R) announced his retirement on January 25, 2018. He resigned on April 27, 2018; his seat was filled by a special election for the remainder of the term. Pennsylvania 15: Charlie Dent (R) announced his retirement on September 7, 2017. He resigned on May 12, 2018; his seat was filled by a special election for the remainder of the term. Texas 27: Blake Farenthold (R) announced his retirement on December 14, 2017. He resigned on April 6, 2018; his seat was filled by a special election for the remainder of the term. Utah 3: Jason Chaffetz (R) announced his retirement on April 19, 2017. He resigned on June 30, 2017; his seat was filled by special election for the remainder of the term. West Virginia 3: Evan Jenkins (R) announced his retirement on May 8, 2017, to run for U.S. Senator. He lost the nomination and then resigned on September 30, 2018, when appointed to the Supreme Court of Appeals of West Virginia. His seat was filled by regular election for the 116th Congress. In eighty-six races the margin of victory was under 10%. For special elections held in 2017, see 2017 United States elections § House of Representatives. Elections ordered by election date. Pennsylvania 18 Tim Murphy Republican 2002 Incumbent resigned. New member elected March 13, 2018. Successor also elected later to the new redistricted seat in the 17th district, see below. Arizona 8 Trent Franks Republican 2002 Incumbent resigned. New member elected April 24, 2018. Successor also elected later to the next term, see below. Texas 27 Blake Farenthold Republican 2010 Incumbent resigned. New member elected June 30, 2018. Ohio 12 Pat Tiberi Republican 2000 Incumbent resigned. New member elected August 7, 2018. Michigan 13 John Conyers Democratic 1964 Incumbent resigned December 5, 2017. New member elected November 6, 2018. A different Democratic candidate was elected the same day to the next term, see below. New York 25 Louise Slaughter Democratic 1986 Incumbent died March 16, 2018. Successor was also elected the same day to the next term, see below. Pennsylvania 7 Pat Meehan Republican 2010 Incumbent resigned April 27, 2018. Successor also elected the same day to the new redistricted seat in the 5th district, see below. Pennsylvania 15 Charlie Dent Republican 2004 Incumbent resigned May 12, 2018. The Democratic candidate won the same day's election to the new redistricted seat in the 7th district, see below. For the regularly scheduled November elections. ↑ All races were decided on the initial primary date, precluding the need for a runoff. The state congressional delegation remained the same at 6-1 for Republicans. R+15 Bradley Byrne Republican 2013 (Special) Incumbent re-elected. R+16 Martha Roby Republican 2010 Incumbent re-elected. R+16 Mike Rogers Republican 2002 Incumbent re-elected. R+30 Robert Aderholt Republican 1996 Incumbent re-elected. R+18 Mo Brooks Republican 2010 Incumbent re-elected. R+26 Gary Palmer Republican 2014 Incumbent re-elected. D+20 Terri Sewell Democratic 2010 Incumbent re-elected. Republicans maintained control of the sole seat in the state. R+9 Don Young Republican 1972 Incumbent re-elected. The state congressional delegation flipped from a 5-4 Republican majority to a 5-4 Democratic majority. R+2 Tom O'Halleran Democratic 2016 Incumbent re-elected. R+1 Martha McSally Republican 2014 Incumbent retired to run for U.S. Senator. D+13 Raúl Grijalva Democratic 2002 Incumbent re-elected. R+21 Paul Gosar Republican 2010 Incumbent re-elected. R+15 Andy Biggs Republican 2016 Incumbent re-elected. R+9 David Schweikert Republican 2010 Incumbent re-elected. D+23 Ruben Gallego Democratic 2014 Incumbent re-elected. R+13 Debbie Lesko Republican 2018 (Special) Incumbent re-elected. D+4 Kyrsten Sinema Democratic 2012 Incumbent retired to run for U.S. Senator. The state congressional delegation remained the same with a 4-0 Republican majority. R+17 Rick Crawford Republican 2010 Incumbent re-elected. R+7 French Hill Republican 2014 Incumbent re-elected. R+19 Steve Womack Republican 2010 Incumbent re-elected. R+17 Bruce Westerman Republican 2014 Incumbent re-elected. The Democratic majority increased from 39-14 to 46-7. R+11 Doug LaMalfa Republican 2012 Incumbent re-elected. D+22 Jared Huffman Democratic 2012 Incumbent re-elected. D+5 John Garamendi Democratic 2009 (Special) Incumbent re-elected. R+10 Tom McClintock Republican 2008 Incumbent re-elected. D+21 Mike Thompson Democratic 1998 Incumbent re-elected. D+21 Doris Matsui Democratic 2005 (Special) Incumbent re-elected. D+3 Ami Bera Democratic 2012 Incumbent re-elected. R+9 Paul Cook Republican 2012 Incumbent re-elected. D+8 Jerry McNerney Democratic 2006 Incumbent re-elected. EVEN Jeff Denham Republican 2010 Incumbent lost re-election. D+21 Mark DeSaulnier Democratic 2014 Incumbent re-elected. D+37 Nancy Pelosi Democratic 1987 Incumbent re-elected. D+40 Barbara Lee Democratic 1998 (Special) Incumbent re-elected. D+27 Jackie Speier Democratic 2008 (Special) Incumbent re-elected. D+20 Eric Swalwell Democratic 2012 Incumbent re-elected. D+9 Jim Costa Democratic 2004 Incumbent re-elected. D+25 Ro Khanna Democratic 2016 Incumbent re-elected. D+23 Anna Eshoo Democratic 1992 Incumbent re-elected. D+24 Zoe Lofgren Democratic 1994 Incumbent re-elected. D+23 Jimmy Panetta Democratic 2016 Incumbent re-elected. D+5 David Valadao Republican 2012 Incumbent lost re-election. R+8 Devin Nunes Republican 2002 Incumbent re-elected. R+14 Kevin McCarthy Republican 2006 Incumbent re-elected. D+7 Salud Carbajal Democratic 2016 Incumbent re-elected. EVEN Steve Knight Republican 2014 Incumbent lost re-election. D+7 Julia Brownley Democratic 2012 Incumbent re-elected. D+16 Judy Chu Democratic 2009 (Special) Incumbent re-elected. D+23 Adam Schiff Democratic 2000 Incumbent re-elected. D+29 Tony Cárdenas Democratic 2012 Incumbent re-elected. D+18 Brad Sherman Democratic 1996 Incumbent re-elected. D+8 Pete Aguilar Democratic 2014 Incumbent re-elected. D+17 Grace Napolitano Democratic 1998 Incumbent re-elected. D+16 Ted Lieu Democratic 2014 Incumbent re-elected. D+35 Jimmy Gomez Democratic 2017 (Special) Incumbent re-elected. D+19 Norma Torres Democratic 2014 Incumbent re-elected. D+2 Raul Ruiz Democratic 2012 Incumbent re-elected. D+37 Karen Bass Democratic 2010 Incumbent re-elected. D+17 Linda Sánchez Democratic 2002 Incumbent re-elected. EVEN Ed Royce Republican 1992 Incumbent retired. D+33 Lucille Roybal-Allard Democratic 1992 Incumbent re-elected. D+12 Mark Takano Democratic 2012 Incumbent re-elected. R+9 Ken Calvert Republican 1992 Incumbent re-elected. D+29 Maxine Waters Democratic 1990 Incumbent re-elected. D+35 Nanette Barragán Democratic 2016 Incumbent re-elected. R+3 Mimi Walters Republican 2014 Incumbent lost re-election. D+15 Lou Correa Democratic 2016 Incumbent re-elected. D+13 Alan Lowenthal Democratic 2012 Incumbent re-elected. R+4 Dana Rohrabacher Republican 1988 Incumbent lost re-election. R+1 Darrell Issa Republican 2000 Incumbent retired. R+11 Duncan Hunter Republican 2008 Incumbent re-elected. D+22 Juan Vargas Democratic 2012 Incumbent re-elected. D+6 Scott Peters Democratic 2012 Incumbent re-elected. D+14 Susan Davis Democratic 2000 Incumbent re-elected. The state congressional delegation flipped from a 4-3 Republican majority to a 4-3 Democratic majority. D+21 Diana DeGette Democratic 1996 Incumbent re-elected. D+9 Jared Polis Democratic 2008 Incumbent retired to run for Governor of Colorado. R+6 Scott Tipton Republican 2010 Incumbent re-elected. R+13 Ken Buck Republican 2014 Incumbent re-elected. R+14 Doug Lamborn Republican 2006 Incumbent re-elected. D+2 Mike Coffman Republican 2008 Incumbent lost re-election. D+6 Ed Perlmutter Democratic 2006 Incumbent re-elected. The state congressional delegation remained unchanged at 5-0 Democrats. D+12 John Larson Democratic 1998 Incumbent re-elected. D+3 Joe Courtney Democratic 2006 Incumbent re-elected. D+9 Rosa DeLauro Democratic 1990 Incumbent re-elected. D+7 Jim Himes Democratic 2008 Incumbent re-elected. D+2 Elizabeth Esty Democratic 2012 Incumbent retired. Democrats retained control of the sole seat in the state. D+6 Lisa Blunt Rochester Democratic 2016 Incumbent re-elected. The Republican majority was reduced from 16-11 to 14-13. R+22 Matt Gaetz Republican 2016 Incumbent re-elected. R+18 Neal Dunn Republican 2016 Incumbent re-elected. R+9 Ted Yoho Republican 2012 Incumbent re-elected. R+17 John Rutherford Republican 2016 Incumbent re-elected. D+12 Al Lawson Democratic 2016 Incumbent re-elected. R+7 Vacant Rep. Ron DeSantis (R) resigned after the filing deadline. EVEN Stephanie Murphy Democratic 2016 Incumbent re-elected. R+11 Bill Posey Republican 2008 Incumbent re-elected. D+5 Darren Soto Democratic 2016 Incumbent re-elected. D+11 Val Demings Democratic 2016 Incumbent re-elected. R+15 Daniel Webster Republican 2010 Incumbent re-elected. R+8 Gus Bilirakis Republican 2006 Incumbent re-elected. D+2 Charlie Crist Democratic 2016 Incumbent re-elected. D+7 Kathy Castor Democratic 2006 Incumbent re-elected. R+6 Dennis Ross Republican 2010 Incumbent retired. R+7 Vern Buchanan Republican 2006 Incumbent re-elected. R+13 Tom Rooney Republican 2008 Incumbent retired. R+5 Brian Mast Republican 2016 Incumbent re-elected. R+13 Francis Rooney Republican 2016 Incumbent re-elected. D+31 Alcee Hastings Democratic 1992 Incumbent re-elected. D+9 Lois Frankel Democratic 2012 Incumbent re-elected. D+6 Ted Deutch Democratic 2010 (Special) Incumbent re-elected. D+11 Debbie Wasserman Schultz Democratic 2004 Incumbent re-elected. D+34 Frederica Wilson Democratic 2010 Incumbent re-elected. R+4 Mario Díaz-Balart Republican 2002 Incumbent re-elected. D+6 Carlos Curbelo Republican 2014 Incumbent lost re-election. D+5 Ileana Ros-Lehtinen Republican 1989 Incumbent retired. The Republican majority was reduced from 10-4 to 9-5. R+9 Buddy Carter Republican 2014 Incumbent re-elected. D+6 Sanford Bishop Democratic 1992 Incumbent re-elected. R+18 Drew Ferguson Republican 2016 Incumbent re-elected. D+24 Hank Johnson Democratic 2006 Incumbent re-elected. D+34 John Lewis Democratic 1986 Incumbent re-elected. R+8 Karen Handel Republican 2017 (Special) Incumbent lost re-election. R+9 Rob Woodall Republican 2010 Incumbent re-elected. R+15 Austin Scott Republican 2010 Incumbent re-elected. R+31 Doug Collins Republican 2012 Incumbent re-elected. R+15 Jody Hice Republican 2014 Incumbent re-elected. R+17 Barry Loudermilk Republican 2014 Incumbent re-elected. R+9 Rick Allen Republican 2014 Incumbent re-elected. D+20 David Scott Democratic 2002 Incumbent re-elected. R+27 Tom Graves Republican 2010 (Special) Incumbent re-elected. Hawaii maintained its 2-0 Democratic hold. D+17 Colleen Hanabusa Democratic 2016 Incumbent retired to run for Governor of Hawaii. D+19 Tulsi Gabbard Democratic 2012 Incumbent re-elected. Idaho maintained its 2-0 Republican hold. R+21 Raúl Labrador Republican 2010 Incumbent retired to run for Governor of Idaho. R+17 Mike Simpson Republican 1998 Incumbent re-elected. The Democratic majority increased from 11–7 to 13–5. D+27 Bobby Rush Democratic 1992 Incumbent re-elected. D+29 Robin Kelly Democratic 2013 (Special) Incumbent re-elected. D+6 Dan Lipinski Democratic 2004 Incumbent re-elected. D+33 Luis Gutiérrez Democratic 1992 Incumbent retired. D+20 Mike Quigley Democratic 2008 Incumbent re-elected. R+2 Peter Roskam Republican 2006 Incumbent lost re-election. D+38 Danny Davis Democratic 1996 Incumbent re-elected. D+8 Raja Krishnamoorthi Democratic 2016 Incumbent re-elected. D+18 Jan Schakowsky Democratic 1998 Incumbent re-elected. D+10 Brad Schneider Democratic 2016 Incumbent re-elected. D+9 Bill Foster Democratic 2012 Incumbent re-elected. R+5 Mike Bost Republican 2014 Incumbent re-elected. R+3 Rodney Davis Republican 2012 Incumbent re-elected. R+5 Randy Hultgren Republican 2010 Incumbent lost re-election. R+21 John Shimkus Republican 1996 Incumbent re-elected. R+8 Adam Kinzinger Republican 2010 Incumbent re-elected. D+3 Cheri Bustos Democratic 2012 Incumbent re-elected. R+15 Darin LaHood Republican 2015 (Special) Incumbent re-elected. The Republican majority remained at 7–2. D+8 Pete Visclosky Democratic 1984 Incumbent re-elected. R+11 Jackie Walorski Republican 2012 Incumbent re-elected. R+18 Jim Banks Republican 2016 Incumbent re-elected. R+17 Todd Rokita Republican 2010 Incumbent retired to run for U.S. Senator. R+9 Susan Brooks Republican 2012 Incumbent re-elected. R+18 Luke Messer Republican 2012 Incumbent retired to run for U.S. Senator. D+11 André Carson Democratic 2008 (Special) Incumbent re-elected. R+15 Larry Bucshon Republican 2010 Incumbent re-elected. R+13 Trey Hollingsworth Republican 2016 Incumbent re-elected. Iowa's delegation flipped from a 3–11 Republican majority to a 3-1 Democratic majority. D+1 Rod Blum Republican 2014 Incumbent lost re-election. D+1 Dave Loebsack Democratic 2006 Incumbent re-elected. R+1 David Young Republican 2014 Incumbent lost re-election. R+11 Steve King Republican 2002 Incumbent re-elected. The Republican majority slipped from 4–0 to 3–1. R+24 Roger Marshall Republican 2016 Incumbent re-elected. R+10 Lynn Jenkins Republican 2008 Incumbent retired. R+4 Kevin Yoder Republican 2010 Incumbent lost re-election. R+15 Ron Estes Republican 2017 (Special) Incumbent re-elected. Republicans maintained their 5–1 majority. R+23 James Comer Republican 2016 Incumbent re-elected. R+19 Brett Guthrie Republican 2008 Incumbent re-elected. D+6 John Yarmuth Democratic 2006 Incumbent re-elected. R+18 Thomas Massie Republican 2012 Incumbent re-elected. R+31 Hal Rogers Republican 1980 Incumbent re-elected. R+9 Andy Barr Republican 2012 Incumbent re-elected. All incumbents were re-elected and Republicans maintained their 5–1 majority. R+24 Steve Scalise Republican 2008 (Special) Incumbent re-elected. D+25 Cedric Richmond Democratic 2010 Incumbent re-elected. R+20 Clay Higgins Republican 2016 Incumbent re-elected. R+13 Mike Johnson Republican 2016 Incumbent re-elected. R+15 Ralph Abraham Republican 2014 Incumbent re-elected. R+19 Garret Graves Republican 2014 Incumbent re-elected. The 1–1 tie became a 2–0 Democratic hold. This was the use of [Instant-runoff voting|ranked choice voting]] to decide a House race. D+8 Chellie Pingree Democratic 2008 Incumbent re-elected. R+2 Bruce Poliquin Republican 2014 Incumbent lost re-election. Democrats maintained their 7–1 majority. R+14 Andy Harris Republican 2010 Incumbent re-elected. D+11 Dutch Ruppersberger Democratic 2002 Incumbent re-elected. D+13 John Sarbanes Democratic 2006 Incumbent re-elected. D+28 Anthony Brown Democratic 2016 Incumbent re-elected. D+16 Steny Hoyer Democratic 1981 (Special) Incumbent re-elected. D+6 John Delaney Democratic 2012 Incumbent retired to run for U.S. President. D+26 Elijah Cummings Democratic 1996 Incumbent re-elected. D+14 Jamie Raskin Democratic 2016 Incumbent re-elected. Democrats maintained their 9–0 hold. D+12 Richard Neal Democratic 1988 Incumbent re-elected. D+9 Jim McGovern Democratic 1996 Incumbent re-elected. D+9 Niki Tsongas Democratic 2007 (Special) Incumbent retired. D+9 Joe Kennedy III Democratic 2012 Incumbent re-elected. D+18 Katherine Clark Democratic 2013 (Special) Incumbent re-elected. D+6 Seth Moulton Democratic 2014 Incumbent re-elected. D+34 Mike Capuano Democratic 1998 Incumbent lost renomination. D+10 Stephen Lynch Democratic 2001 (Special) Incumbent re-elected. D+4 Bill Keating Democratic 2010 Incumbent re-elected. The delegation flipped from a 9-5 Republican majority to a 7-7 split. R+9 Jack Bergman Republican 2016 Incumbent re-elected. R+9 Bill Huizenga Republican 2010 Incumbent re-elected. R+6 Justin Amash Republican 2010 Incumbent re-elected. R+10 John Moolenaar Republican 2014 Incumbent re-elected. D+5 Dan Kildee Democratic 2012 Incumbent re-elected. R+4 Fred Upton Republican 1986 Incumbent re-elected. R+7 Tim Walberg Republican 2010 Incumbent re-elected. R+4 Mike Bishop Republican 2014 Incumbent lost re-election. D+4 Sander Levin Democratic 1982 Incumbent retired. R+13 Paul Mitchell Republican 2016 Incumbent re-elected. R+4 Dave Trott Republican 2014 Incumbent retired. D+14 Debbie Dingell Democratic 2014 Incumbent re-elected. D+32 Vacant Predecessor, John Conyers (D) resigned December 5, 2017. A different Democratic candidate was elected the same day to finish the current term. D+30 Brenda Lawrence Democratic 2014 Incumbent re-elected. Altough half of the seats switched parties, Democrats maintained the same 5–3 majority. R+5 Tim Walz Democratic 2006 Incumbent retired to run for Governor of Minnesota. R+2 Jason Lewis Republican 2016 Incumbent lost re-election. D+1 Erik Paulsen Republican 2008 Incumbent lost re-election. D+14 Betty McCollum Democratic 2000 Incumbent re-elected. D+26 Keith Ellison Democratic 2006 Incumbent retired to run for Minnesota Attorney General. R+12 Tom Emmer Republican 2014 Incumbent re-elected. R+12 Collin Peterson Democratic 1990 Incumbent re-elected. R+4 Rick Nolan Democratic 2012 Incumbent retired. The Republicans maintained their 3-1 majority in the state. R+16 Trent Kelly Republican 2015 (Special) Incumbent re-elected. D+14 Bennie Thompson Democratic 1992 Incumbent re-elected. R+13 Gregg Harper Republican 2008 Incumbent retired. R+21 Steven Palazzo Republican 2010 Incumbent re-elected. The Republicans maintained their 6-2 seat majority. D+29 Lacy Clay Democratic 2000 Incumbent re-elected. R+8 Ann Wagner Republican 2012 Incumbent re-elected. R+18 Blaine Luetkemeyer Republican 2008 Incumbent re-elected. R+17 Vicky Hartzler Republican 2010 Incumbent re-elected. D+7 Emanuel Cleaver Democratic 2004 Incumbent re-elected. R+16 Sam Graves Republican 2000 Incumbent re-elected. R+23 Billy Long Republican 2010 Incumbent re-elected. R+24 Jason Smith Republican 2013 (Special) Incumbent re-elected. Republicans maintained control of the lone house seat. R+11 Greg Gianforte Republican 2017 (Special) Incumbent re-elected. Republicans maintained their 3-0 majority. R+11 Jeff Fortenberry Republican 2004 Incumbent re-elected. R+4 Don Bacon Republican 2016 Incumbent re-elected. R+27 Adrian Smith Republican 2006 Incumbent re-elected. Democrats maintained their 3-1 majority. D+15 Dina Titus Democratic 2012 Incumbent re-elected. R+7 Mark Amodei Republican 2011 (Special) Incumbent re-elected. R+2 Jacky Rosen Democratic 2016 Incumbent retired to run for U.S. Senator. D+3 Ruben Kihuen Democratic 2016 Incumbent retired. The Democrats maintained control of both house seats. R+2 Carol Shea-Porter Democratic 2016 Incumbent retired. D+2 Ann McLane Kuster Democratic 2012 Incumbent re-elected. The state congressional delegation changed from 7-5 for Democrats to 11-1 for Democrats. D+13 Donald Norcross Democratic 2014 Incumbent re-elected. R+1 Frank LoBiondo Republican 1994 Incumbent retired. R+2 Tom MacArthur Republican 2014 Incumbent lost re-election. R+8 Chris Smith Republican 1980 Incumbent re-elected. R+3 Josh Gottheimer Democratic 2016 Incumbent re-elected. D+9 Frank Pallone Democratic 1988 Incumbent re-elected. R+3 Leonard Lance Republican 2008 Incumbent lost re-election. D+27 Albio Sires Democratic 2006 Incumbent re-elected. D+16 Bill Pascrell Democratic 1996 Incumbent re-elected. D+36 Donald Payne Democratic 2012 Incumbent re-elected. R+3 Rodney Frelinghuysen Republican 1994 Incumbent retired. D+16 Bonnie Watson Coleman Democratic 2014 Incumbent re-elected. The state congressional delegation changed from 2-1 for Democrats to all 3 seats being controlled by Democrats. D+7 Michelle Lujan Grisham Democratic 2012 Incumbent retired to run for Governor of New Mexico. R+6 Steve Pearce Republican 2010 Incumbent retired to run for Governor of New Mexico. D+8 Ben Ray Luján Democratic 2008 Incumbent re-elected. Democrats increased their seat majority in New York's congressional delegation from 18-9 to 21-6. R+5 Lee Zeldin Republican 2014 Incumbent re-elected. R+3 Peter King Republican 1992 Incumbent re-elected. D+1 Thomas Suozzi Democratic 2016 Incumbent re-elected. D+4 Kathleen Rice Democratic 2014 Incumbent re-elected. D+37 Gregory Meeks Democratic 1998 Incumbent re-elected. D+16 Grace Meng Democratic 2012 Incumbent re-elected. D+38 Nydia Velázquez Democratic 1992 Incumbent re-elected. D+36 Hakeem Jeffries Democratic 2012 Incumbent re-elected. D+34 Yvette Clarke Democratic 2006 Incumbent re-elected. D+26 Jerry Nadler Democratic 1992 Incumbent re-elected. R+3 Dan Donovan Republican 2015 (Special) Incumbent lost re-election. D+31 Carolyn Maloney Democratic 1992 Incumbent re-elected. D+43 Adriano Espaillat Democratic 2016 Incumbent re-elected. D+29 Joe Crowley Democratic 1998 Incumbent lost renomination but remained on ballot. D+44 José Serrano Democratic 1990 Incumbent re-elected. D+24 Eliot Engel Democratic 1988 Incumbent re-elected. D+7 Nita Lowey Democratic 1988 Incumbent re-elected. R+1 Sean Patrick Maloney Democratic 2012 Incumbent re-elected. R+2 John Faso Republican 2016 Incumbent lost re-election. D+7 Paul Tonko Democratic 2008 Incumbent re-elected. R+4 Elise Stefanik Republican 2014 Incumbent re-elected. R+6 Claudia Tenney Republican 2016 Incumbent lost re-election. R+6 Tom Reed Republican 2010 Incumbent re-elected. D+3 John Katko Republican 2014 Incumbent re-elected. D+8 Vacant Incumbent Louise Slaughter died March 16, 2018. D+11 Brian Higgins Democratic 2004 Incumbent re-elected. R+11 Chris Collins Republican 2012 Incumbent re-elected. Due to allegations of electoral fraud, the 116th Congress was sworn in with one seat vacant. On February 21, 2019, a new election was ordered by the state election board. D+17 G. K. Butterfield Democratic 2004 (Special) Incumbent re-elected. R+7 George Holding Republican 2012 Incumbent re-elected. R+12 Walter Jones Republican 1994 Incumbent re-elected. D+17 David Price Democratic 1996 Incumbent re-elected. R+10 Virginia Foxx Republican 2004 Incumbent re-elected. R+9 Mark Walker Republican 2014 Incumbent re-elected. R+9 David Rouzer Republican 2014 Incumbent re-elected. R+8 Richard Hudson Republican 2012 Incumbent re-elected. R+8 Robert Pittenger Republican 2012 Incumbent lost renomination. Results void and new election ordered. R+12 Patrick McHenry Republican 2004 Incumbent re-elected. R+14 Mark Meadows Republican 2012 Incumbent re-elected. D+18 Alma Adams Democratic 2014 Incumbent re-elected. R+6 Ted Budd Republican 2016 Incumbent re-elected. Republicans maintained control of the sole house seat. R+16 Kevin Cramer Republican 2012 Incumbent retired to run for U.S. Senator. The state congressional delegation remained the same at 12-4 for Republicans. R+5 Steve Chabot Republican 2010 Incumbent re-elected. R+9 Brad Wenstrup Republican 2012 Incumbent re-elected. D+19 Joyce Beatty Democratic 2012 Incumbent re-elected. R+14 Jim Jordan Republican 2006 Incumbent re-elected. R+11 Bob Latta Republican 2006 Incumbent re-elected. R+16 Bill Johnson Republican 2010 Incumbent re-elected. R+12 Bob Gibbs Republican 2010 Incumbent re-elected. R+17 Warren Davidson Republican 2016 (Special) Incumbent re-elected. D+14 Marcy Kaptur Democratic 1982 Incumbent re-elected. R+4 Mike Turner Republican 2002 Incumbent re-elected. D+32 Marcia Fudge Democratic 2006 Incumbent re-elected. R+7 Troy Balderson Republican 2018 (Special) Incumbent re-elected. D+7 Tim Ryan Democratic 2002 Incumbent re-elected. R+5 David Joyce Republican 2012 Incumbent re-elected. R+7 Steve Stivers Republican 2010 Incumbent re-elected. R+8 Jim Renacci Republican 2010 Incumbent retired to run for U.S. Senator. The state congressional delegation changed from 5-0 for Republicans to a 4-1 Republican majority. R+17 Vacant Rep. Jim Bridenstine (R) resigned after the filing deadline. R+24 Markwayne Mullin Republican 2012 Incumbent re-elected. R+27 Frank Lucas Republican 1994 Incumbent re-elected. R+20 Tom Cole Republican 2002 Incumbent re-elected. R+10 Steve Russell Republican 2014 Incumbent lost re-election. The state congressional delegation remained the same with a 4-1 Democratic majority. D+9 Suzanne Bonamici Democratic 2012 (Special) Incumbent re-elected. R+11 Greg Walden Republican 1998 Incumbent re-elected. D+24 Earl Blumenauer Democratic 1996 Incumbent re-elected. EVEN Peter DeFazio Democratic 1986 Incumbent re-elected. EVEN Kurt Schrader Democratic 2008 Incumbent re-elected. As a result of changes in the congressional map, the state congressional delegation changed from a 13-5 Republican majority to a 9-9 tie between the two parties. Redistricted from the 8th district Republican 2016 Incumbent re-elected. Redistricted from the 13th district Democratic 2014 Incumbent re-elected. Redistricted from the 2nd district Democratic 2016 Incumbent re-elected. Redistricted from the 1st district Democratic 1998 (Special) Incumbent retired. D+7 Open seat Incumbent ran in the 10th district. D+13 Vacant Rep. Pat Meehan (R) resigned April 27, 2018 after being redistricted from the 7th district. D+2 Ryan Costello Republican 2014 Incumbent retired. D+1 Vacant Rep. Charlie Dent (R) resigned May 12, 2018 after being redistricted from the 15th district. Redistricted from the 17th district Democratic 2012 Incumbent re-elected. Redistricted from the 11th district Republican 2010 Incumbent retired to run for U.S. Senator. Redistricted from the 4th district Republican 2012 Incumbent re-elected. Redistricted from the 16th district Republican 2016 Incumbent re-elected. Redistricted from the 10th district Republican 2010 Incumbent re-elected. Redistricted from the 9th district Republican 2002 Incumbent retired. R+14 Open seat Incumbent ran in the 17th district. Redistricted from the 5th district Republican 2008 Incumbent re-elected. Redistricted from the 3rd district Republican 2010 Incumbent re-elected. Redistricted from the 18th district Democratic 2018 (Special) Incumbent re-elected. Redistricted from the 12th district Republican 2012 Incumbent lost re-election. Redistricted from the 14th district Democratic 1994 Incumbent re-elected. The state congressional delegation remained unchanged at 2-0 for Democrats. D+16 David Cicilline Democratic 2010 Incumbent re-elected. D+6 James Langevin Democratic 2000 Incumbent re-elected. The state congressional delegation changed from 6-1 for Republicans to 5-2 for Republicans. R+10 Mark Sanford Republican 2013 (Special) Incumbent lost renomination. R+12 Joe Wilson Republican 2001 Incumbent re-elected. R+19 Jeff Duncan Republican 2010 Incumbent re-elected. R+15 Trey Gowdy Republican 2010 Incumbent retired. R+9 Ralph Norman Republican 2017 (Special) Incumbent re-elected. D+19 Jim Clyburn Democratic 1992 Incumbent re-elected. R+9 Tom Rice Republican 2012 Incumbent re-elected. Republicans retained control of the sole seat in the state. R+14 Kristi Noem Republican 2010 Incumbent retired to run for Governor of South Dakota. Republicans maintained their 7-2 seat majority. R+28 Phil Roe Republican 2008 Incumbent re-elected. R+20 Jimmy Duncan Republican 1988 (Special) Incumbent retired. R+18 Chuck Fleischmann Republican 2010 Incumbent re-elected. R+20 Scott DesJarlais Republican 2010 Incumbent re-elected. D+7 Jim Cooper Democratic 2002 Incumbent re-elected. R+24 Diane Black Republican 2010 Incumbent retired to run for Governor of Tennessee. R+20 Marsha Blackburn Republican 2002 Incumbent retired to run for U.S. Senator. R+19 David Kustoff Republican 2016 Incumbent re-elected. D+28 Steve Cohen Democratic 2006 Incumbent re-elected. The state congressional delegation changed from a 25-11 Republican majority to a 23-13 Republican majority. R+25 Louie Gohmert Republican 2004 Incumbent re-elected. R+11 Ted Poe Republican 2004 Incumbent retired. R+13 Sam Johnson Republican 1991 Incumbent retired. R+28 John Ratcliffe Republican 2014 Incumbent re-elected. R+16 Jeb Hensarling Republican 2002 Incumbent retired. R+9 Joe Barton Republican 1984 Incumbent retired. R+7 John Culberson Republican 2000 Incumbent lost re-election. R+28 Kevin Brady Republican 1996 Incumbent re-elected. D+29 Al Green Democratic 2004 Incumbent re-elected. R+9 Michael McCaul Republican 2004 Incumbent re-elected. R+32 Mike Conaway Republican 2004 Incumbent re-elected. R+18 Kay Granger Republican 1996 Incumbent re-elected. R+33 Mac Thornberry Republican 1994 Incumbent re-elected. R+12 Randy Weber Republican 2012 Incumbent re-elected. D+7 Vicente Gonzalez Democratic 2016 Incumbent re-elected. D+17 Beto O'Rourke Democratic 2012 Incumbent retired to run for U.S. Senator. R+12 Bill Flores Republican 2010 Incumbent re-elected. D+27 Sheila Jackson Lee Democratic 1994 Incumbent re-elected. R+27 Jodey Arrington Republican 2016 Incumbent re-elected. D+10 Joaquín Castro Democratic 2012 Incumbent re-elected. R+10 Lamar Smith Republican 1986 Incumbent retired. R+10 Pete Olson Republican 2008 Incumbent re-elected. R+1 Will Hurd Republican 2014 Incumbent re-elected. R+9 Kenny Marchant Republican 2004 Incumbent re-elected. R+11 Roger Williams Republican 2012 Incumbent re-elected. R+18 Michael Burgess Republican 2002 Incumbent re-elected. R+13 Michael Cloud Republican 2018 (Special) Incumbent re-elected. D+9 Henry Cuellar Democratic 2004 Incumbent re-elected. D+19 Gene Green Democratic 1992 Incumbent retired. D+29 Eddie Bernice Johnson Democratic 1992 Incumbent re-elected. R+10 John Carter Republican 2002 Incumbent re-elected. R+5 Pete Sessions Republican 1996 Incumbent lost re-election. D+23 Marc Veasey Democratic 2012 Incumbent re-elected. D+10 Filemon Vela Jr. Democratic 2012 Incumbent re-elected. D+15 Lloyd Doggett Democratic 1994 Incumbent re-elected. R+26 Brian Babin Republican 2014 Incumbent re-elected. The state congressional delegation changed from 4-0 for Republicans to a 3-1 Republican majority. R+26 Rob Bishop Republican 2002 Incumbent re-elected. R+16 Chris Stewart Republican 2012 Incumbent re-elected.